I’ve traditionally been a sandwich guy. Or more generally, I’ve always liked the starch completely integrated with the protein/bean/veggie item so it can be consumed by hand, with a relatively uniform experience throughout. That’s burgers, pizza, and burritos man. These things have supplied endless joy to me for my whole life. Feel me? But times, they are a changing. Ever since coming back from Hawaii I have a newfound respect for the plate meal. A plate meal is one menu item made up of three to five ingredients arranged happenstance on a plate meant to be consumed in any manner of in-plate combinations. They do it right at Aripo’s (Oak Park, IL) on the weekends for their brunch special. This is the Venezuelan plate brunch. 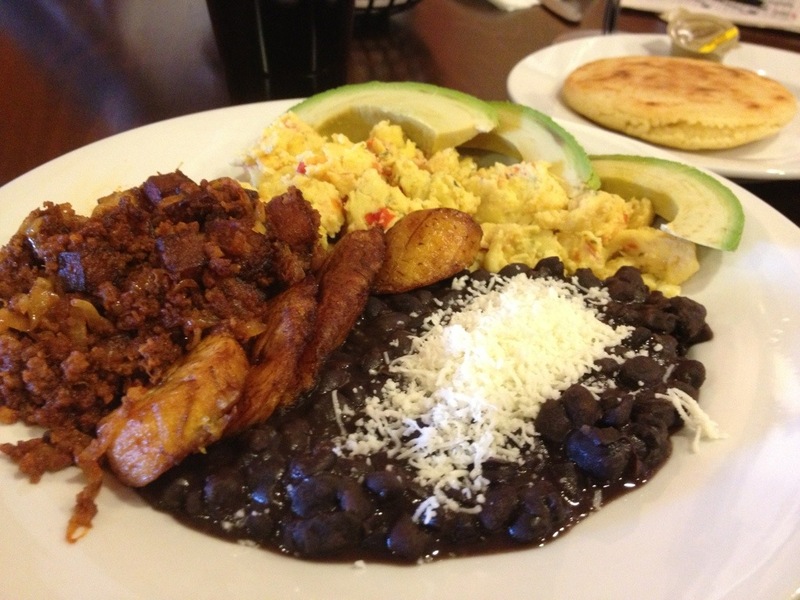 It has black beans, eggs, fried plantains, chorizo hash, avocados, and an arepa on the side. The chorizo was an add-on, I think it just came with potatoes. I loved everything on it. Each forkful ranged from two to four ingredients and every one was different. Aripo’s is my most consistently enjoyable meal. Period. Make the trip. Posted in food on 2013/04/30 by John.